DNC VS THE NEWS MEDIA. What the DNC is trying to accomplish and what the news media wants to accomplish are at odds. The DNC is trying to unify loyalties around Barack Obama after he unexpectedly bested Hillary Clinton--the once hands-down favorite to win the party's nomination--in the primaries. The news media is doing its dead-level best (with some help by Republican plants and Republican pundits) to fuel the discord for the sake of tantalizing story lines. MAJOR POWER SHIFT. Do you realize we're watching a major shift in power within the Democratic Party? It is moving from a Clinton base to an Obama base. It is moving from a white majority to a thoroughly diverse constituency. It is moving from control focused in an older generation to leadership influence shared with a younger generation. It is moving from 1960's-era perspective and battle lines to a new millennial outlook and policy formation. Such major shifts are not easy and not pretty. UGLY ALTERNATIVE SCENARIO. For whatever hurt or bad feelings Hillary's supporters feel because their candidate lost--fair and square--to Obama, whatever "disenfranchisement" or unfairness her supporters may claim, just imagine the scenario had Hillary managed to finagle a narrow but questionable win over Obama. The low-level angst we are witnessing is kid's play compared to an unmitigated mutiny if Hillary had, by hook or crook, wrested the nomination from Barack. MOVING TOWARD THE CENTER. We are also witnessing a Democratic Party that is making one further step from its traditional liberal platform. Stalwart Republicans may not appreciate this, but Bill Clinton took the party a major step toward the center of the political spectrum. He was a centrist and an economic conservative. In many ways, Clinton positioned the nation to be a champion in a post-Cold War world economy and global reality. 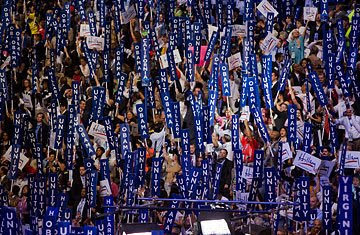 At this convention, the Democratic Party will pass a platform that continues its movement toward the political center. And it will put forward a candidate for President who truly represents the next generation in national and international leadership. While the right will still try to paint Obama and the Democrats as big-spending, tax-raising liberals, new DNC leadership is trying to effectively reframe pressing national challenges and offer a viable alternative to the same ol', same ol' politics of left and right. "And it will put forward a candidate for President who truly represents the next generation in national and international leadership." I'm not as optimistic as your post suggests. Guess that is always the trouble with so-called candidates of change. We hope that we are getting something and often the Washington culture makes it such that it doesnt happen. Not sure Obama's voting record as a Senator shows him as a new type of liberal. Candidates always say lots of things during elections cycles and even if they are well meaning, they dont follow through or get caught up in the huge bureaucracy that is our nation's capital. While nothing's a sure thing, I will think there is a real option in this general election to vote one's hopes and not one's fears. Not sure if I'm more optimistic, but I think I am less cynical of Obama than I am of either the status quo or other options. I started tracking Obama after his speech at the 2004 DNC Convention. I've read one of his books, followed his emergence as a leader and admired his Christian faith and character. Being a community organizer myself, I've got a lot of admiration for what he accomplished in Chicago and the community-based way he approaches problems and problem solving. People who've worked in the trenches in struggling urban neighborhoods realize he's not just spouting off hopeful notions. But his is an approach that Washington is not used to. Can it make a dent in Washington ways? To me, it's worth a fresh approach and a person who has, to this point, reflected integrity and a degree of sheer inspiration that we have not seen in a generation. The alternatives don't seem to be very promising. It's worth it to me to try to watch and observe the subtlties between "liberal" and "progressive." I see a real difference. But that's hard to do in the midst of campaign rhetoric coming from all sides. Folks get pigeonholed with soundbytes, etc. But it is, in fact, the nuanced differences, approaches, underpinnings, motivations, trajectories, etc. that will be lived out once the election is over. For whatever it's worth, Obama seems to struggle with "typical" Democratic and liberal issues in a similar what that John McCain has struggled with "typical" Republican and right-wing issues. Both seem to be more center than either of their parties like. Do you agree?